IW/SGC Speakeasy Sundance Kid of Fractal AKA "Toby"
We are very honored to have Toby added to our cattery program. 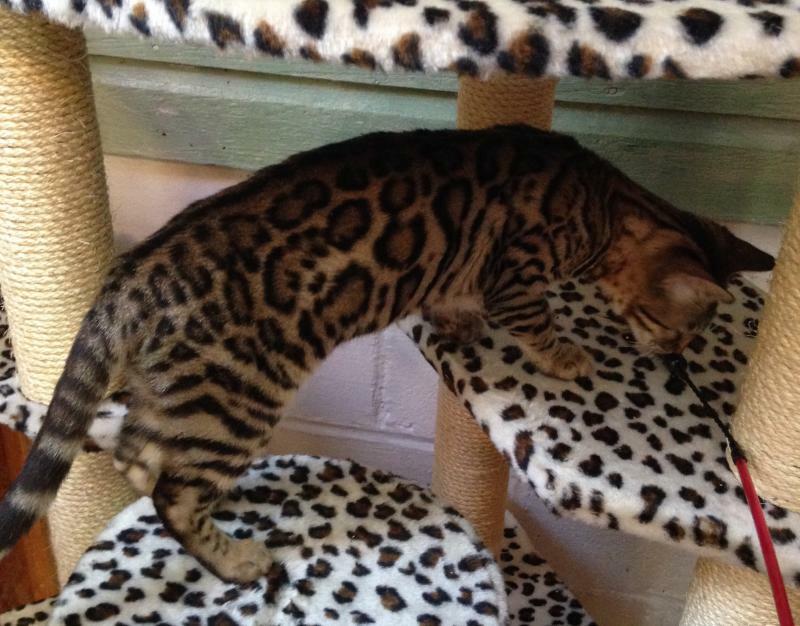 Toby is an amazingly sweet, friendly boy who was the Best Bengal in TICA USA a few years back. He stamps his gorgeous looks onto all of his babies. Toby is a very typey boy but also has the most beautiful flow and rosetting. We can not wait to see what he produces with our girls while here at Jungletime. Toby has been screened HCM normal yearly and will continue to be screened. RW/SGC Fractal Free To Be AKA "Bman"
Bman is such a love, he is the son of our past male Triton which we truly adored. When we were offered the chance to have Bman come and stay with us, we jumped at the chance! He has the same loving, laid back personality of his father and that is just what we want him to pass to his offspring. Bman had a very successful show career and loves the ladies. His structure and body type is to die for, so long and muscular. Bman has been HCM screened many times, yearly, and has always screened Normal. This beautiful girl is Temptra. She is very sweet, but also super excitable! She is so active and friendly. Temptra has the most amazing pattern, her contrast is to die for and it keeps getting better and better as she matures! Jet black outlined huge rosetting with a nice balanced body and pretty face. Temptra produces gorgeous super sweet babies! Temptra was HCM screened in January 2018 normal. "Naughty and Nice" AKA "Not Not"
Not Not is from our good friend Marie at Fractal Bengals. She is just a sweetie pie, and of course just beautiful. 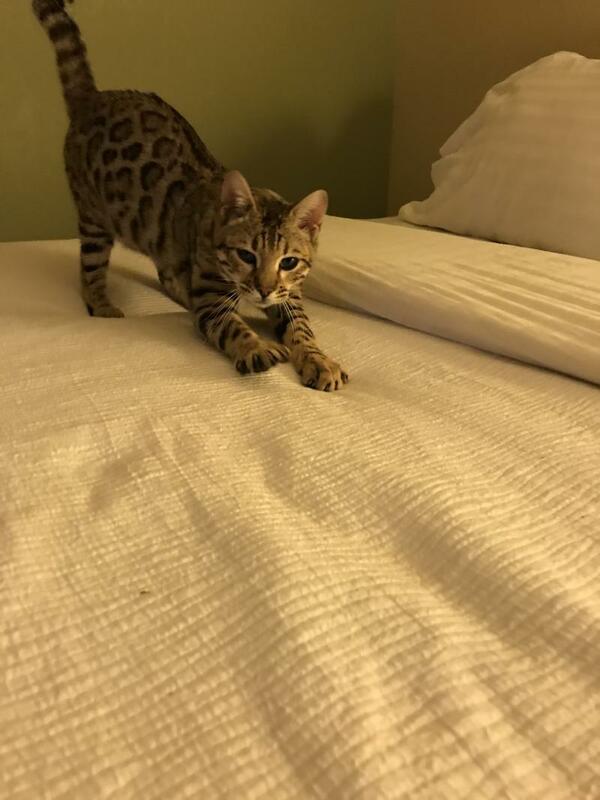 She is a lynx point rosetted snow Bengal. Not Not is a big girl, built like a little tank, very heavy and solid. Her head is so beautiful and wild looking and that muzzle is to die for. She produces stunning babies, many with successful show careers! She was HCM screened by Veterinary Cardiologist in 2018 and was Normal. 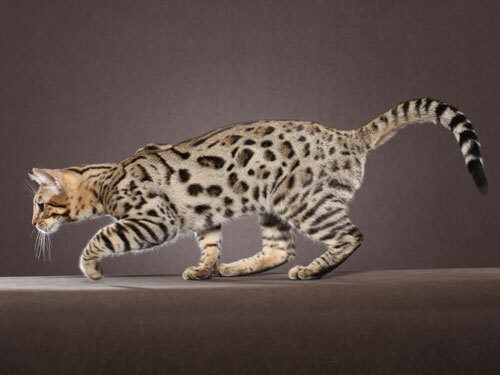 CH Jungletime Talladega Nights AKA "Tallie"
Tallie is such a gorgeous cat. She was born here at Jungletime, from Bellatrix and Toby. Her type is phenomenal and her personality is just fantastic. She loves feathers and mice and will chase a bug for hours! Her show career is just starting and she is already a Champion. We look forward to showing her in 2018 and watching her mature!